Python development headers, usually found in the python-dev package. The compression/decompression features will use the python headers and gcc. pefile is optional, and may be used for additional parsing. The simplest way to use the module to detect or parse firmware is through the AutoParser class. 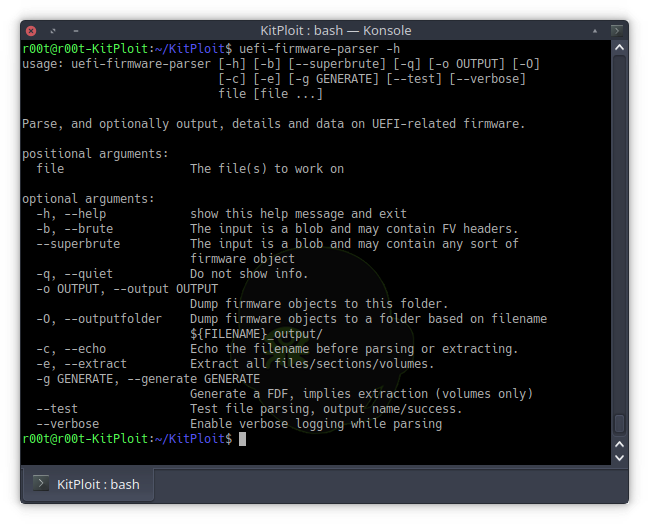 Parse, and optionally output, details and data on UEFI-related firmware. -b, --brute           The input is a blob and may contain FV headers. -q, --quiet           Do not show info. Dump firmware objects to this folder. -c, --echo            Echo the filename before parsing or extracting. -e, --extract         Extract all files/sections/volumes. --test                Test file parsing, output name/success. If you need to parse and extract a large number of firmware files check out the -O option to auto-generate an output folder per file. If parsing and searching for internals in a shell the --echo option will print the input filename before parsing. The firmware-type checker will decide how to best parse the file. If the --test option fails to identify the type, or calls it unknown, try to use the -b or --superbrute option. The later performs a byte-by-byte type checker. Injection or GUID replacement (no addition/subtraction yet) can be performed on sections within a UEFI firmware file, or on UEFI firmware files within a firmware filesystem. Search a file for UEFI firmware volumes, parse and output. -c, --capsule         The input file is a firmware capsule. -p, --pfs             The input file is a Dell PFS. -f, --ff              Inject payload into firmware file. --guid GUID           GUID to replace (inject). Pre-generated EFI file to inject. Note: when injecting into a firmware file the user will be prompted for which section to replace. At the moment this is not-yet-scriptable. There is an included script to generate additional GUID labels to import into IDA Python using Snare's plugins. Using the -g LABEL the script will generate a Python dictionary-formatted output. This project will try to keep up-to-date with popular vendor GUIDs automatically. Output GUIDs for files, optionally write GUID structure file. -c, --capsule         The input file is a firmware capsule, do not search. -d, --flash           The input file is a flash descriptor. Generate a behemoth-style GUID output. -u, --unknowns        When generating also print unknowns. This module has been tested on BIOS/UEFI/firmware updates from the following vendors. Not every update for every product will parse, some may required a-priori decompression or extraction from the distribution update mechanism (typically a PE).